Sergei Berezniuk, director of the Phoenix Fund and a long-time partner of Pacific Environment dedicates his life in protecting endangered Siberian Tigers and the ecosystem in which they depend on. Sergei Berezniuk’s fight to protect the endangered Siberian tiger helps save an entire ecosystem. In the summer of 2012, eight Siberian tiger skins, including those of little tiger cubs, were seized from a resident of Arseniev town in Primorye in the Russian Far East. The offender was well-known to the local police because he has been buying and selling illegal wildlife products since the 1990s. These tiger deaths are not isolated incidents. Twelve years ago, Sergei realized that Siberian tigers would be pushed to extinction if one were to count on the government to protect Russia’s endangered big cats from poaching and habitat destruction. Since then, he and his team of six have been working tirelessly to ensure the survival of the endangered Siberian tiger over a territory of 64,000 square miles-much of it pristine taiga forest wilderness. 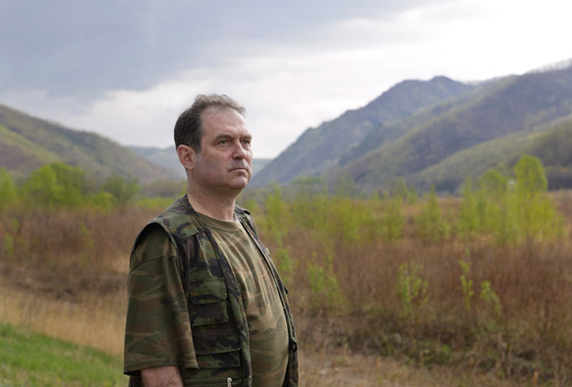 In the Russian Far East, it’s easier to meet a poacher than a tiger. Even today, poaching remains the principal threat to the tigers’ survival. The animals are killed in retaliation, mainly for loss of cattle and wild prey, as hunting trophies, or to be used in Chinese traditional medicine. Despite international laws banning the sale of tiger parts, there is a lucrative market that fuels poaching. 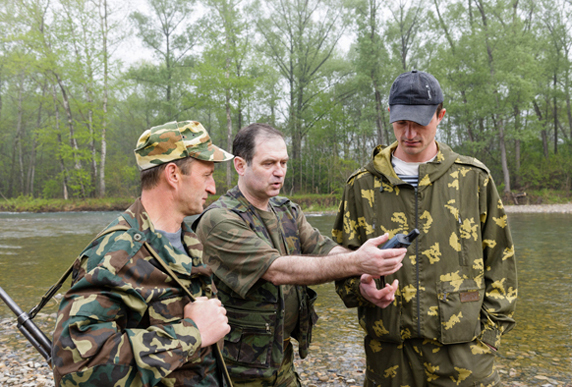 Pacific Environment helps Vladivostok-based Phoenix Fund establish, train, and outfit local anti-poaching brigades. Sergei’s anti-poaching work took a major leap forward when the Phoenix Fund started outfitting the anti-poaching units it coordinates with newly-developed GPS software that allows the rangers to track and hunt down poachers. It also allows them to record their observations on tigers and wildlife in general. But Sergei’s efforts to protect the approximately 350-500 wild tigers still roaming the frontier region bordering China and the Sea of Japan goes far beyond his efforts to curb poaching. Sergei views the Siberian tiger as a powerful driver for the general conservation of its ecosystem—the taiga forest. That’s why as part of their anti-poaching duties, the rangers also record information on the state of the forest and the reach of illegal loggers. Moreover, Phoenix Fund is one of five participants in Pacific Environment’s groundbreaking black carbon pilot project in Russia. 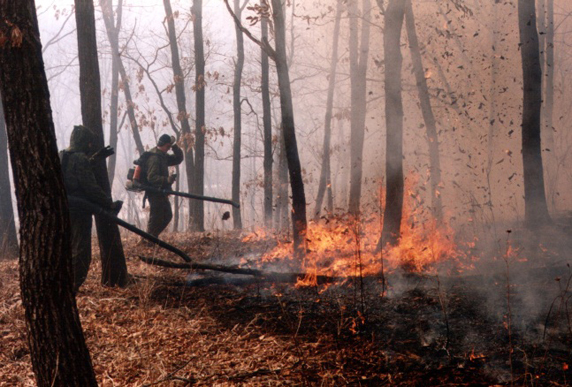 This project seeks to reduce forest fires. Wildfires are a serious threat to the Siberian tiger because they take a toll on its habitat by turning forest into open meadows and brushwood. Furthermore, they are a significant source of black carbon, which accelerates Arctic ice melt and thus climate change. Farmers in rural Russia often intentionally set fires to clear cultivated lands of crop residue or brush from pastures. Poorly controlled, they frequently lead to uncontrollable forest fires. In fact, these fires contribute over a third of black carbon emissions in the Arctic—with Russia responsible for about 43 percent of them. Phoenix Fund collaborates with wildlife managers to reduce these forest fires. It trains and coordinates volunteer fire brigades that prevent and fight fires together with park staff in two regional wildlife preserves. A third tactic in Sergei’s efforts to protect the Siberian tiger and taiga forest is education of local people. Phoenix Fund works directly with educators and children, and it creates educational materials, films, and art competitions. Once a year, it puts on its biggest event, Tiger Day. 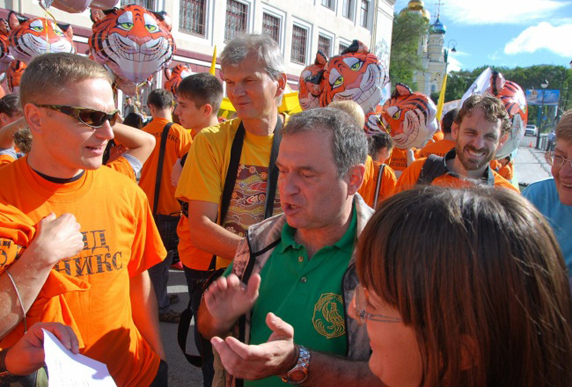 A powerful motivational tool, in 2012 the festival featured over 4,000 costumed schoolchildren and students, decked out in various shades of orange tiger stripes, walking down the city’s main street together with some of Russia’s most prominent environmental activists to raise awareness of tiger and forest conservation. About 5,000 spectators attended. We are proud that our partner’s successful efforts to help stabilize the Siberian tiger population have been honored with such a prestigious award. The fate of the endangered Siberian tiger rests in the hands of the people of the Russian Far East. Pacific Environment helps local environmental heroes like Sergei Berezniuk and his team at the Phoenix Fund fight to preserve untouched wilderness, strengthen the implementation and enforcement of environmental laws, and encourage ordinary citizens to take action where government forces are simply too weak to effectively protect one of the world’s most magnificent creatures—the Siberian Tiger.